The new year often comes with clean-eating resolutions. Make this year's healthy habits stick with these 6 essential tips! The start of any new year is a time when many people resolve to clear their cupboards, toss the junk, and clean up their diets. They&apos;re ready to attack a diet and fitness plan head-on, hoping to make changes they&apos;ve never made before. And, yet, most people fall off the wagon before February rolls around. Instead of rolling down the road as the wagon carries on, run ahead of the wagon by sticking to the following six tips. Yes, they&apos;re simple, but nutrition doesn&apos;t need to be overly complicated. Simple is often best, and these tips will help you whether you&apos;re trying to build muscle, lose fat, or start leading a healthier lifestyle. Don&apos;t hop onto the first nutrition plan that promises fast results. Not all plans are devised the same way, and your nutrition strategy should directly support your personal health and fitness goals. "The first step for starting a successful nutrition program is picking one that&apos;s appropriate for your specific goal," advises James Grage, co-founder and vice president of BPI Sports. 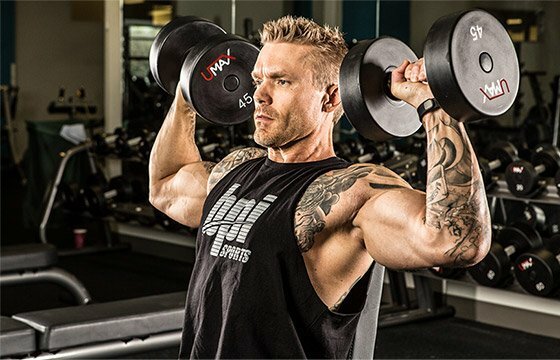 "Plans can vary greatly depending on whether you want to build lean muscle while minimizing fat gains, build maximum muscle and strength, or simply get shredded." James firmly believes that being clear on your goal before starting any program is an absolute must. Otherwise, you might follow the wrong plan entirely. "The foods you eat may remain mostly consistent from fitness plan to plan, but the amount of calories and macros will vary significantly depending on how you want your body to look," he adds. If you&apos;re unsure where to start or have struggled to transform in the past, check out Grage&apos;s own Rewired Trainer. Rewired is designed to help you discover and overcome the specific hurdles and obstacles on your fitness journey. The nutrition plan is clean, simple, and easy to follow. It&apos;s intended to help you form healthy habits for a lifetime, and it&apos;s even accompanied by a nine-week training program. Once you&apos;ve chosen your plan, it&apos;s time to learn the wonderful art of meal planning. "If you start your day without your meals planned, it&apos;s going to be very difficult for you to stick to any diet," advises James. It&apos;s difficult to make large quantities of fresh food daily, especially if you&apos;re cooking every meal for yourself and a partner or family. To that end, it&apos;s a good idea to get into the habit of taking 30 minutes once per week, typically on a Sunday, to plan your meals for the week ahead. Taking the guesswork out of dieting drastically increases the chance that you&apos;ll stick with a new nutritional strategy. Planning your food also makes it far less likely that you fall prey to the fast food drive-thru or convenience store foods that tempt you in moments of weakness. Now that you have your meals planned, it&apos;s time to prep. "At minimum, try and prep your meals the night before," suggests James. Ideally, you should prepare meals a few days in advance, so that you only have to cook once or twice per week. People often fall off their fitness plans due to a lack of prep time, so make things as simple as possible: Always cook your meals in bulk so that you have plenty of leftovers for the days that follow, and invest in some high-quality Tupperware so that you can store your meals in the fridge or freezer until you&apos;re ready to eat. 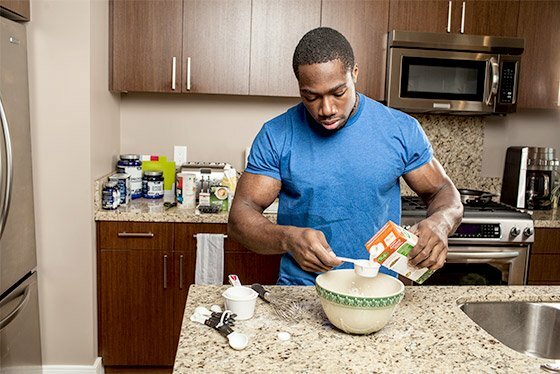 If you&apos;re short on meal ideas, check out Kevin Alexander&apos;s article "5 Healthy Recipes to Hack Meal Prep." From breakfast omelet roll-ups to stuffed sweet potatoes, Kevin will help you start on the right foot. For even more options, check out the Healthy Recipe Database. For those extremely busy days when being short on time brings your meal prep to a halt, be prepared with a back-up plan. Keep healthy snacks like nuts, jerky, and protein powder nearby whenever possible. 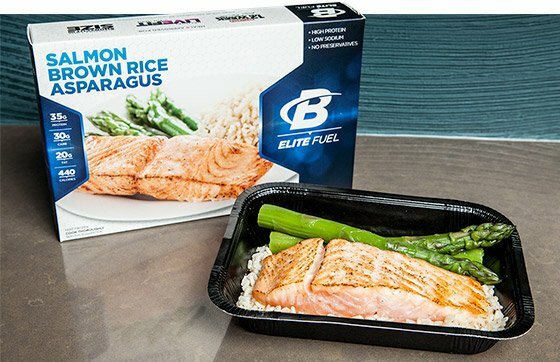 "I always have a surplus of B-Elite meals in my freezer, at home, or at work," says Grage, who relies on the macro-friendly meals when he&apos;s in a pinch. They&apos;re high in protein, low in sodium, and contain the perfect mix of nutrients to help you reach your goals. For those extremely busy days when being short on time brings your meal prep to a halt, be prepared with a back-up plan. This doesn&apos;t necessarily mean you should be running to the freezer aisle, though. Be careful about typical frozen meals found at your local grocer. They&apos;re often significantly lacking in protein, very low in fiber, and won&apos;t provide the level of nutrients your active body needs. Not to mention, the sodium in most of those meals is enough to make abs nearly invisible, even on any lean body. Whether or not you follow a specific diet that restricts certain foods, you should form the foundation of your nutrition plan on whole, unprocessed choices. Your diet should spring from a rich abundance of natural foods like chicken, beef, broccoli, greens, brown rice, sweet potatoes, and healthy fat sources like almonds and fatty fish. It shouldn&apos;t be based on boxed or packaged meals. Reserve highly processed foods—like potato chips and breaded chicken strips, for example—and foods loaded with refined, simple carbohydrates—like donuts and pre-packaged desserts—for occasional "treat" meals or extremely special occasions. These highly processed foods are often devoid of micronutrients. They can be detrimental to your health and physique goals. Whether or not you follow a specific diet that restricts certain foods, you should form the foundation of your nutrition plan on whole, unprocessed choices. You don&apos;t have to restrict processed foods from your diet entirely, but you should always look for healthier alternatives. Instead of buying a frozen cake at the store, for example, bake one at home so you know exactly what you&apos;re putting into your body. Try any of these healthy desserts, for example! Finally, as you go about planning your nutrition program, make sure you&apos;re tracking your caloric intake. While you don&apos;t have to count every crumb, being able to effectively eyeball your portion sizes is important. Apps like MyFitnessPal make tracking easier than ever, and most fitness plans on Bodybuilding.com will help you determine your daily calorie intake. If you want to get really fit, it&apos;s not enough to just "eat healthy." You do need to hit the proper calorie and macronutrient targets to get the aesthetic results you&apos;re looking for. Remember, healthy food isn&apos;t a nutritional free-for-all. It takes both healthy foods and the right quantities to achieve successful results. Fitness is an individual sport, and it&apos;s tough to get top athletes to share their tips for successful training. See BPI athletes pull back the curtain! Learn their secrets! Don&apos;t let your fitness resolutions become another statistic. Create a solid game plan with these powerful tools and head into the New Year prepared for battle. That six-pack hiding under your belly fat doesn&apos;t have to stay there! Learn how to make those ripped abdominal dreams a reality.